French author, born at Nantes on the 8th of February 1828. After completing his studies at the Nantes lycée, he went to Paris to study for the bar. About 1848, in conjunction with Michel Carré, he wrote librettos for two operettas, and in 1850 his verse comedy, Les Pailles rompues, in which Alexandre Dumas fils had some share, was produced at the Gymnase. For some years his interests alternated between the theater and the bourse, but some travellers' stories which he wrote for the Musée des Familles seem to have revealed to him the true direction of his talent the delineation -- that of delightfully extravagant voyages and adventures to which cleverly prepared scientific and geographical details lent an air of verisimilitude. Something of the kind had been done before, after kindred methods, by Cyrano de Bergerac, by Jonathan Swift and Daniel Defoe, and later by Mayne Reid. But in his own particular application of plausible scientific apparatus Verne undoubtedly struck out a department for himself in the wide literary genre of voyages imaginaires. His first success was obtained with Cinq semaines en ballon, which he wrote for Hetzel's Magazin d'Éducation in 1862, and from that point forward, for a quarter of a century, scarcely a year passed in which Hetzel did not publish one or more of his fantastic stories, illustrated generally by pictures of the most lurid and sensational description. The most successful of these romances include: Voyage au centre de la terre (1864); De la terre à la lune (1865); Vingt mille lieues sous les mers (1869); Les Anglais au pole nord (1870); and Voyage autour du monde en quatre-vingts jours, which first appeared in Le Temps in 1872. The adaptation of this last (produced with immense success at the Porte St. Martin theater on the 8th of November 1874) and of another excellent tale, Michael Strogoff (at the Châtelet, 1880), both dramas being written in conjunction with Adolphe d'Ennery, proved the most acceptable of Verne's theatrical pieces. The novels were translated into the various European languages and had an enormous success in England. But after 1877, when he published Hector Servadac, a romance of existence upon a comet, the writer's invention began to show signs of fatigue (his kingdom had been invaded in different directions and at different times by such writers as R. M. Ballantyne, H. Rider Haggard and H. G. Wells), and he even committed himself, somewhat unguardedly, to very gloomy predictions as to the future of the novel. 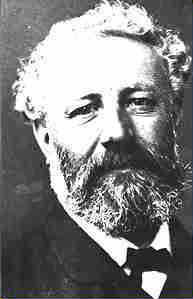 Jules Verne's own novels, however, will certainly long continue to delight readers by reason of their sparkling style, their picturesque verve -- apparently inherited directly from Dumas -- their amusing and good-natured national caricatures, and the ingenuity with which the love element is either subordinated or completely excluded. Verne, who was always extremely popular in society, divided his time for the most part between Paris, his home at Amiens and his yacht. He was a member of the Legion of Honour, and several of his romances were crowned by the French Academy, but he was never enrolled among its members. He died at Amiens on the 24th of March 1905. His brother, Paul Verne, contributed to the Transactions of the French Alpine Club, and wrote an Ascension du Mont Blanc for his brother's collection of Voyages extraordinaires in 1874.